A floral display of spring colour, a summer party in the park and a Halloween fundraising 3k run are some of the highlights residents can expect at the new look Winsford Town Park this year. Cheshire West and Chester Council has helped the Friends of Winsford Town Park group to buy equipment and it is hard at work in the park to ensure it is looking good for these events. The chair of Friends of Winsford Town Park John Malam said: “Cheshire West has been 100% supportive. We have received funds to purchase our display banners and our new high vis jackets branded with the Friends logo, and gardening tools which we are going to put to good use over the coming months. “We are establishing bat and bird boxes with funds provided by Winsford Town Council, and on 29 June we will be hosting ‘Party in the Park’ to celebrate Town Park’s first birthday. Later in the year there is going to be a Halloween themed three kilometre family fun run in aid of the Neuromuscular Centre, which is based in Winsford – the Friends will be acting as marshalls. “We are working with Joanne Fawcett who is the lead horticulturist, who has given us a lot advice and instruction for her planting scheme. It is a prairie planting scheme based on the design work of renouned Dutch landscape designer Piet Oudolf. We are looking forward to how it is going to mature. 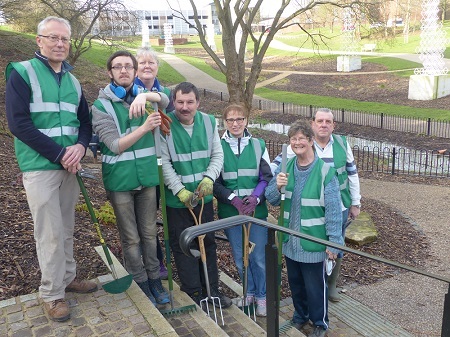 Cllr Gina Lewis, Town Mayor of Winsford, said: “It is a good thing that there are so many volunteers within our community who are willing to give their time and their energy and are now showing great intent in the Town Park." 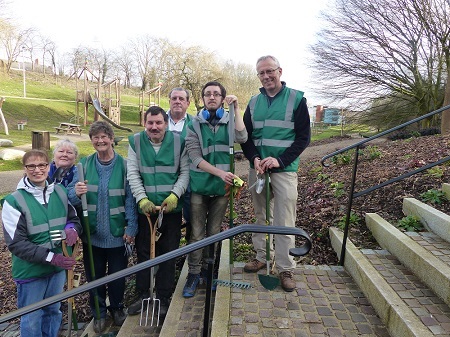 The Friends group is also taking part in the Great British Spring Clean and has registered with the Keep Britain Tidy campaign, organisers of this national initiative. The weekend litter pick is 23-24 March, and the plan is to tidy up Winsford’s ‘grot spots’. John said: “Litter is part of society but all we can be seen to be doing is setting an example, anybody can go along and pick up litter. The more people are seen to be doing it, the less likely it is for people to make waste and litter. It is important to engage with our younger people and our schools. You sow the seeds with younger people and it’s less likely that they are going to be our litterers in the future. Anyone can join the Friends of Winsford Town Park group. For more information, visit its facebook page.